The mild onion taste of the common Leek is an integral component in many recipes. Quite often, sand and dirt becomes caked between the individual leafs as the Leek grows. This sediment can ruin the final dish if the Leek is not properly cleaned beforehand. The following information offers a quick and easy cleaning method. Begin by trimming away any fibrous roots remaining at the bottom of the Leek. Make sure you do not cut away the solid white core that holds the individual leafs of the Leek together. Cut off the dark green leaf tops leaving only the tender white and light green portion by the root (The tops are edible but tend to be very tough. They are commonly used to flavor stocks or as the wrapper for a bouquet garni). Split the Leek in half lengthwise from the root to top (This is the point where the dark green leafs were trimmed off). Lay each Leek half on a flat cutting surface so the round side faces up. Insert the knife tip about ½ an inch above the root and slice lengthwise toward the top. Do not cut all the way through the root end. You should be left with two Leek halfs, each split down the middle, but still connected at the root. Gently bend each half to loosen all of the layers. Rinse each one under cold running water, making sure the root end is pointed up and the top is pointed down. The running water should wash away any sediment in trapped between the layers. 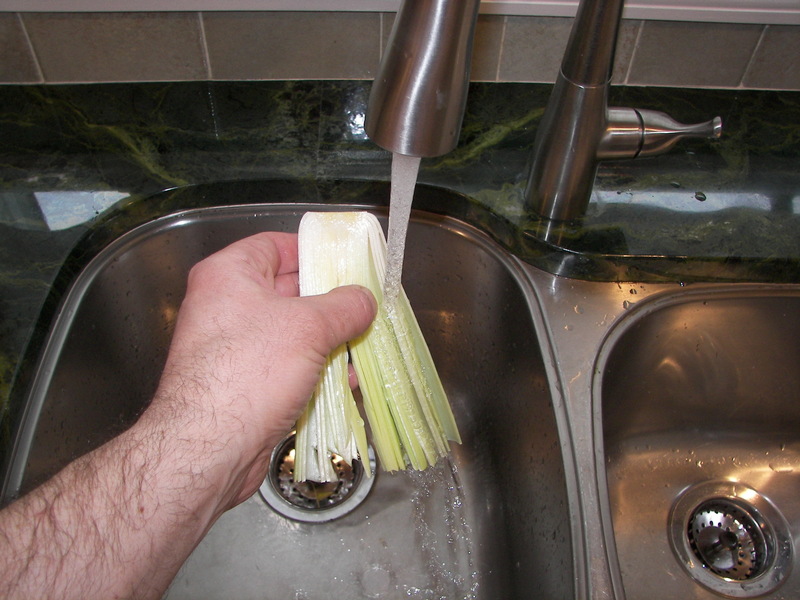 Once the Leek is clean, blot dry with a kitchen towel and slice accordingly for the recipe you are preparing.